Nicotye Samayualie is part of the younger generation of artists in Cape Dorset. In addition to being an artist and a devoted mother, she is has studied art education, and has worked in social services and military recruitment. Samayualie’s drawings reflect her life and personality, while her thoughtful details and individual graphic style demonstrate a contemporary edge. Her landscapes, although inspired by her environment and camping trips with her family, are imaginative and conceptual. Samayualie uses symbolism as a tool to provide a narrative of her life, personifying inanimate objects and flowers to represent her family, personal tales and tragedies. Her drawings often portray a dichotomy; a single image will depict calm and beautiful subjects while embodying the artist’s struggle and suffering. Lady Lonely Flower demonstrates this duality by contrasting a bright and stunning flower against the artist’s personal feelings of desolation due to the absence of her partner in her and her children’s lives. Similarly, the imagery of Thinking of Prayers is at once peaceful and painful, integrating the visual serenity of the landscape with the artist’s emotional devastation. 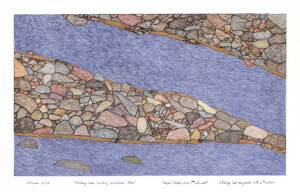 Samayualie’s prints have been featured in the Cape Dorset Annual Print Collection and her drawings have been exhibited in many groups shows in Canada. We are honoured to present her first solo exhibition of original drawings.